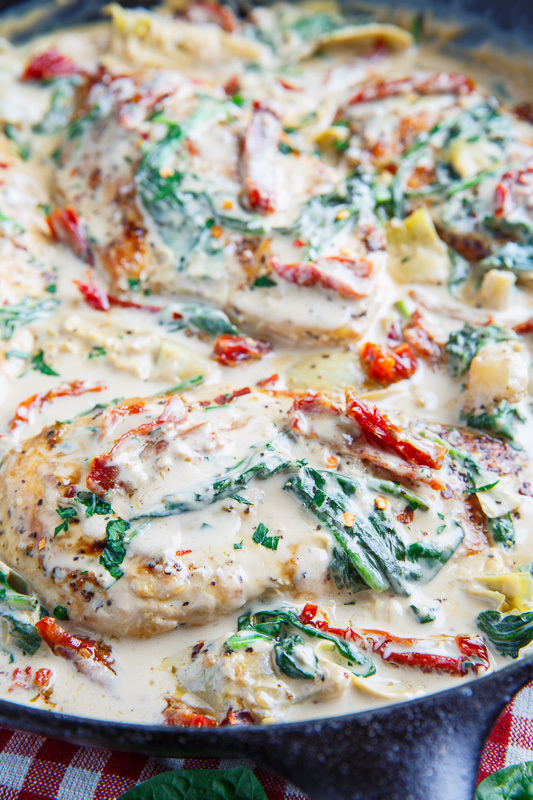 A quick and easy, one pan spinach and artichoke chicken with sundried tomatoes! 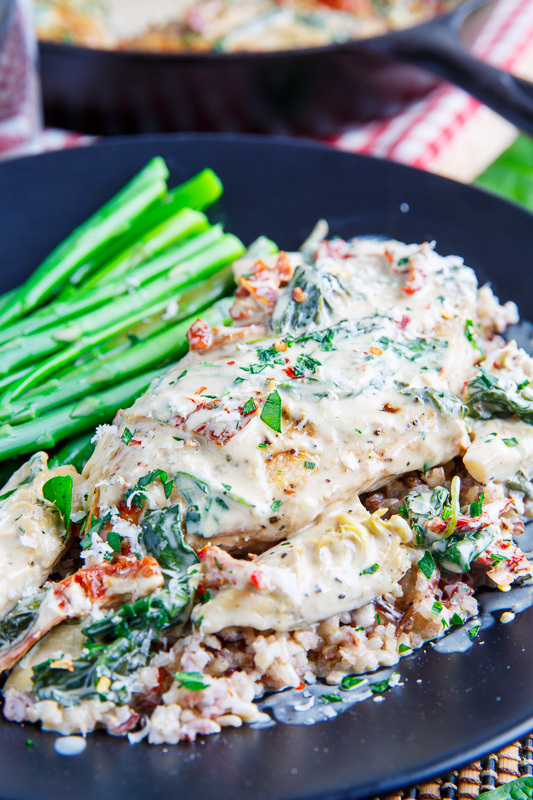 All of the flavours of spinach and artichoke dip in a light and tasty chicken dinner! 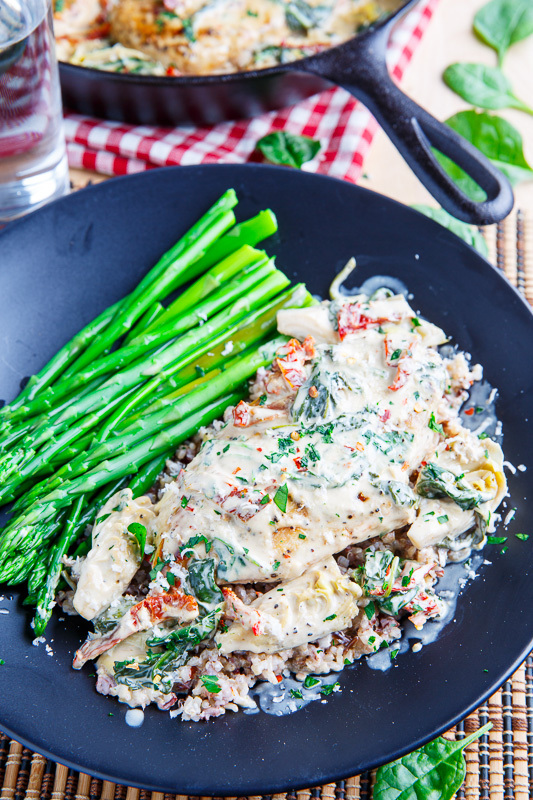 Quick and easy one-pan chicken dinners are always good and since there is so much that you can do with chicken it never needs to be boring! 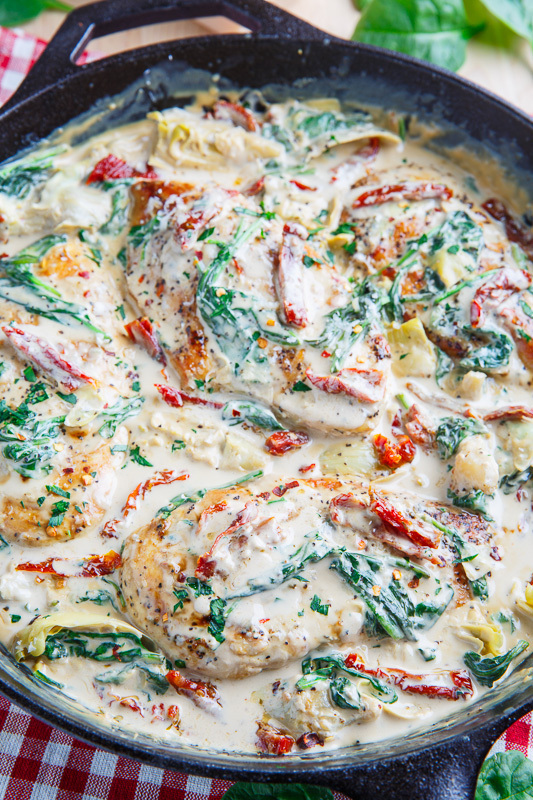 This spinach and artichoke skillet chicken with sundried tomatoes is my new favourite way of making a chicken dinner and it has all of the flavours of spinach and artichoke dip! I mean who doesn’t love spinach and artichoke dip and who wouldn’t want it for dinner? The recipe is really simple and it’s kept pretty light by using a combination of low fat cream cheese and chicken broth as the base of the sauce and it is further flavoured with parmesan cheese and garlic along with a touch of spicy heat from red pepper flakes. I sometimes like to add sundried tomatoes to my spinach and artichoke dip so they were a must and of course there is plenty of both spinach and artichokes to finish things off! 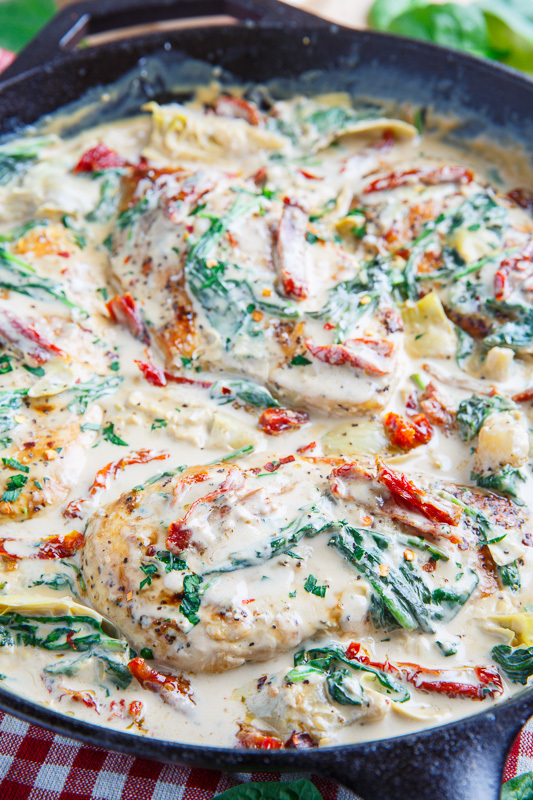 You can serve this spinach and artichoke skillet chicken with sundried tomatoes by itself or over pasta, rice, quinoa, etc and combined with a simple veggie side you have a complete, and supper tasty, meal in under 30 minutes! Heat the oil in a pan over medium-high heat, season the chicken with salt and pepper, add the chicken to the pan and cook until lightly golden brown on both sides and cooked through, about 5 minutes per side, before setting aside. Add the garlic and red pepper flakes to the pan and saute until fragrant, about a minute. Reduce the heat to medium, add the cream cheese and cook, stirring, until the cream cheese has melted, about 2-4 minutes. Add the spinach, artichokes, parmesan and sundried tomatoes and cook unit the spinach has melted before adding the chicken and enjoying! Note: When I am using oil packed sundried tomatoes like in this recipe I like to use the oil from the far whenever possible to add even more flavour! Option: Add shredded mozzarella for an even cheesier sauce! Wow!! What a beautiful skillet dinner! just beautiful! and looks so delicious!! I love using artichokes in recipes! Fantastic recipe Kevin. That sauce looks dreamy. I love a skillet meal! I love skillet meals! They make dinners a breeze! Really love this recipe…easy and so delicious! Keeper! 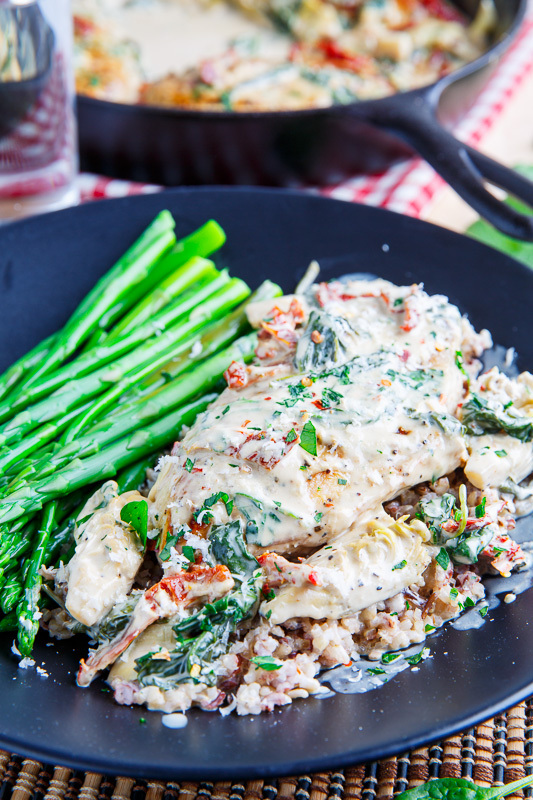 This was the first recipe of yours that I've tried – I can't wait to try more! I used boneless, skinless chicken thighs and used whole (didn't flatten) and I added about 1/2 pound sliced portabello mushrooms ( I made them a little golden in a nonstick pan with a pat of butter). I was really pleasantly surprised with the red. fat cream cheese. Everything was great and easy to make too! Jo K: I'm glad you enjoyed it and I love the addition of mushrooms! Can you possibly substitute cream cheese for greek yougurt? Eric Reineke: Yes that will work! This meal tasted as good as it looked! I've never had much interest in artichoke hearts, but the pictures made it look so decadent and flavorful, i had to give it a try. Except for using full fat cream cheese, I followed the recipe exactly and served over Quinoa – and we all LOVED it!! The fact it contained so many veggies made it even better! This is definitly going into my regular meal rotation! Is the 2 1/4 cups broth on addition to the one cup broth for a total of 3 1/4 cups, or just 2 1/4 cups total? Kevin, made your One pot Greek lemon chicken with rice for the first time last week. OMG…shared the recipe with 3 friends the next day and husband requested it again today. It will def become a regular here. Many thanks!